Bake 45 to 50 Mins. –Dutch oven (should be at least 4 quarts in size) with its lid. Note: (Do not oil Dutch Oven, bread will not stick while baking). Add flour to bowl. Add yeast and sea salt and stir thoroughly. Add barely warm (tepid) water and caraway seeds, then stir thoroughly. The dough will look rough and shaggy. Lightly oil top of dough using a paper towel, then oil your hands (to prevent dough sticking to them); turn dough in the bowl and do so on this side so the whole ball of dough is slightly coated with the oil. Cover the bowl with plastic wrap. Throw a kitchen towel over top and underneath of bowl and set it in a warm corner. Leave it alone for 9-12 hours. (Save plastic wrap). When risen, in the bowl, fold dough over on itself at 3 times, then reform into ball. Using a bit more olive oil on hands and bowl, if need be, to prevent sticking. Cover dough with same plastic wrap and let it sit for 1 hour. About 20 minutes before the hour is up, turn on oven to preheat at 450 degrees. Place an oven-safe Dutch Oven in oven to preheat at the same time as well. as they will be hot enough to scorch standard kitchen towels. After the full hour, the dough will have risen and nearly doubled in size. Quickly shape the dough into a round ball and drop it into the preheated Dutch Oven (be careful because it’s really, really hot). Slash an ‘X’ on top of the dough with the tip of a sharp knife that’s been sprayed w/oil. 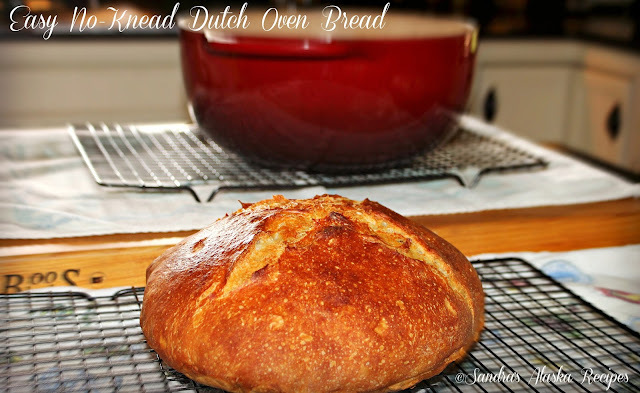 Place lid on hot Dutch Oven and carefully place in oven and bake for 30 minutes. Remove lid from the Dutch Oven and bake for an additional 15 to 20 minutes, until crust is golden. Bread is done when an instant-read thermometer inserted in center reads 190 degrees. Remove bread from oven, and lift loaf out to cool on a baking rack.. To keep warm for serving, wrap loaf in a clean kitchen towel. Slice and serve! ~ Enjoy! This bread is quite forgiving and can be left to rise from 9 to 12 hours, although the longer you let rise the more yeast flavor you’ll end up with.